Chicago Zoological Society - How Do You Ask an Animal How it Feels? HomeBlogs Center for the Science of Animal Care and Welfare November 2017 How Do You Ask an Animal How it Feels? How Do You Ask an Animal How it Feels? This is a question that we, in the animal welfare research, department are constantly asking. While many species share the capacity for similar emotions, these emotions can be expressed differently across species. As researchers at a zoo, we need to think about methods that are specific to each species. While welfare research traditionally has been conducted on mammals, and a few bird species, we are beginning to cast a wider net, so that we can understand the welfare of lesser studied species, such as fish and reptiles for example. Seen here (left to right): a black-and-white clownfish, a female okapi, an Andean condor, a mom and calf pair of bottlenose dolphins, and, last, but not least, the incredible naked mole-rat. 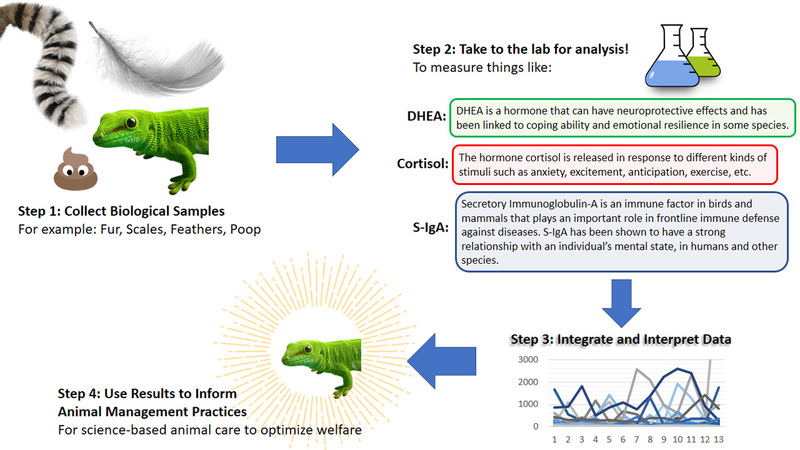 Behavior As A Clue: There are various established methods for collecting clues to understand an animal’s welfare. Some clues come from the animal’s behavior itself: we typically consider an animal that is displaying a wide range of expected natural behaviors to be in a good and healthy mental state. We also look for behaviors that suggest the animal is engaged in its environment, such as exploration, foraging, socializing, digging, swimming, climbing, etc. Two young Mexican grey wolves take a nap together. 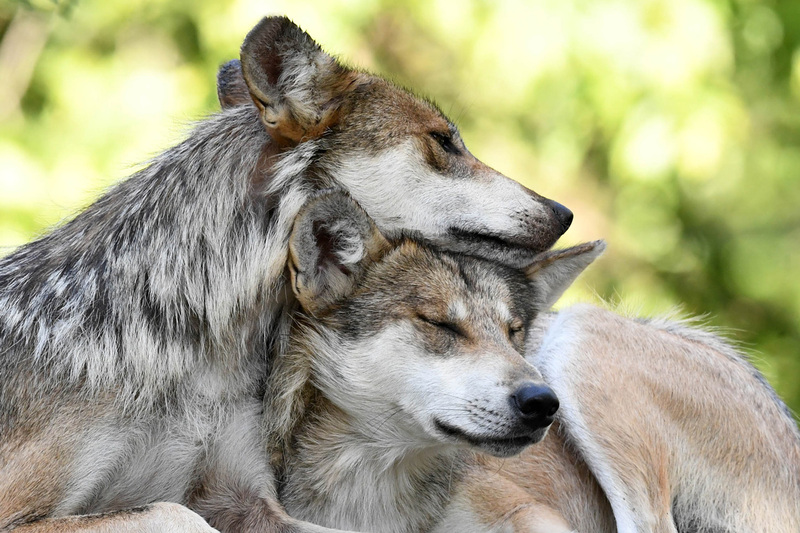 Social bonds are highly important for the welfare of wolves, which are pack-oriented species. Wolves do most everything together: they hunt together, eat together, play together, and rest together. Other species, however, like okapi, are solitary animals, and in general choose to be by themselves, unless it is a mother with her young. Physiology As A Clue: Other clues that indicate how animals feel come from their physiology. Any feather, hair, scale, or excrement dropped by an animal holds powerful clues about their health and mental state. For example, when you are excited, stressed, happy, or sad, you will have different kinds of hormones and proteins circulating throughout your body, depending on your emotional state and level of arousal. These hormones and proteins make their way into your hair, skin, saliva, sweat, feces, etc. and can be measured through laboratory techniques. Animal Care Specialist Assessments As A Clue: We also realize that no one knows our animals better than the people that care for them. Animal care specialists can pick up on subtle behavioral changes in the animals under their care and are often are the first ones to notice if an animal goes from having a series of good days to having an “off” day. Animal care specialist assessments (such as WelfareTrak) are critical tools to help us understand changes in the day-to-day welfare of animals at the zoo. Animal care specialist, Jen McGee, interacts with a young bottlenose dolphin at Seven Seas in a training session. Our dolphins have multiple training sessions from morning to evening, 365 days of the year. From these sessions, animal care specialist (Mark Gonka in photo) then use software tools to conduct behavioral assessments on each individual to monitor their day-to-day wellbeing. Recently, researchers have developed a new method of animal welfare science that is used to infer an animal’s current emotional state. This exciting new method is called “cognitive bias testing” and it has been validated in multiple animal species (including humans!) to evaluate whether an individual is feeling more optimistic or more pessimistic. As an example, let’s say we wanted to perform a cognitive bias test on a sea lion to see if that individual is feeling positive or negative. The first step is to train the sea lion to associate a particular symbol (let’s say a black square) with a highly desirable award (for example, a whole, huge salmon). When the black square is presented, the sea lion would be trained to go to a particular location for his big, salmon reward. At the same time, we also train the sea lion to associate a similar but different symbol (a white square perhaps) for a lesser reward (e.g. a small bite-size piece of salmon). When the white square is presented the sea lion is trained to go to a different location for the small bite-sized treat. Where the cognitive bias testing gets interesting is when we present an ambiguous symbol. For example, in this case, what do you think the sea lion would expect to receive if presented a grey square? Would he go to the location where he expects to get the large salmon, or, would he go to the location where he expects to get the much smaller treat? Where the sea lion decides to go once he sees the ambiguous symbol (the grey square) can inform researchers as to whether or not he is feeling optimistic (an expectation of the bigger (i.e. more positive) reward) or pessimistic (an expectation of the lesser (i.e. more negative) reward). Cognitive bias testing has been validated in a variety of species, such as grizzly bears, mice, and even in bottlenose dolphins. We are very excited that our curator of marine mammals at Seven Seas, Rita Stacey, MSc is currently training our very own bottlenose dolphins here at Brookfield Zoo to learn this method, so that she can perform cognitive bias testing on them in the near future. Check out this video below of Tapeko Dolphin learning how to target on one of the stations that will be used in the experiment. Please check back in for more updates on all of our efforts that are underway to help us understand the welfare of our animals here at Brookfield Zoo.